Digital Video and Imagery Distribution System (DVIDS) is an excellent source of US military video and photos. 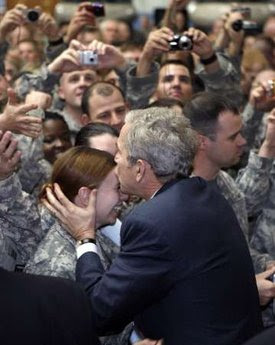 Today DVIDS posted an amazing video of President Bush’s visit with the troops in Iraq. Once again, this is something you will never see in the US mainstream media. The full video of Bush’s speech to the troops is here. B-roll of troop reaction to President George W. Bush’s speech and visit in Iraq. Scenes include Gen. Odierno introducing the President, President Bush speaking at the podium, reaction shots and Bush shaking hands with troops s they applaud him. Also see “Spc. Whitfield, 1st Lt. Benson, Capt. Howell, 1st Lt. Butel” in the interview section. Peace and democracy comes to Iraq.